Located along the Cannon River Valley corridor, Faribault is 60 minutes south of the Twin Cities. 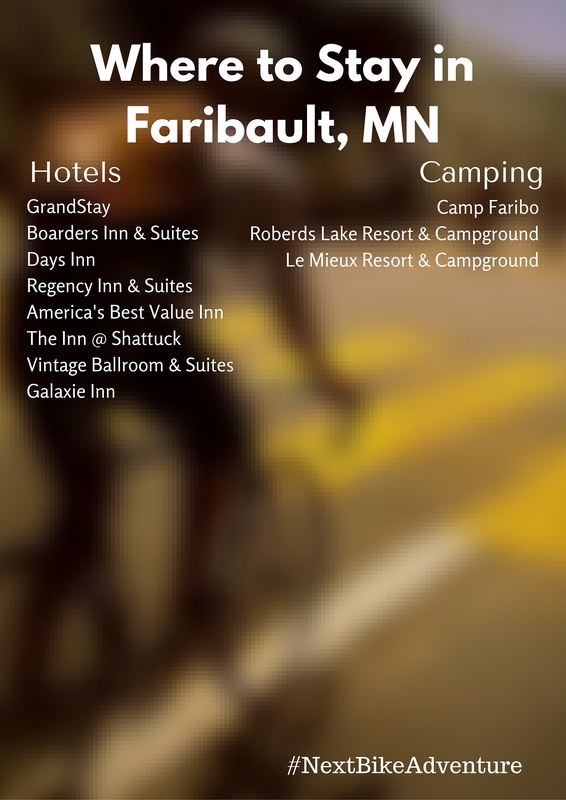 Faribault is a great southern Minnesota destination for a family outing or biking vacation. The relaxed lifestyle and picturesque surroundings here draw many people out to explore. On the east end of the Sakatah Singing Hills State Trail, you will have several loop options that will take you on quiet rural roads for a true touring experience. With plenty of retail areas, recreational activities, and restaurant choices in Faribault, it’s easy to spend several days here. This fat bike cyclist is getting ready to head down to Faribault. Explore and enjoy the beauty of the lakes and rolling terrain around the Faribault area. It is easy to ride your bike to both the city and State Trail from the hotels in town. From the trail, you can continue your adventure as the trail connects to the paved community roads. At the city park, take the 39-mile journey on the paved rail-bed west through Morristown, Waterville, Elysian then onto Mankato. For road riding choose from many scenic loops designed by the local bike club. For the mountain biker, there are miles of off road trails at the River Bend Nature Center. Explore the historic downtown area, Rice County Museum or take a dip at the Aquatic Center, plus golf and many other fun activities in the area. From the Cheese Cave to Augustos Piadina Restaurant, the Faribault area also offers several interesting and charming cafes and ice cream shops. If these do not appeal to you, there are many other options as well. Along with most hotels, many coffee shops and restaurants have Wi-Fi availability. Also, the public library is a good option. The Buckham Memorial Library is located on 11 Division Street East, Faribault, MN 55021 and can be reached by phone at the following number: 507-334-2089. 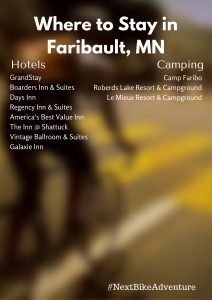 See the Faribault Tourism Bureau for more detailed information.